Law enforcement block downtown Reno, Nev., streets during an active shooter response at the Montage apartment building, Tuesday, Nov. 28, 2017. A suspect is in custody after opening fire for at least 20 minutes Tuesday night, but there are no reports of any injuries, authorities said. The shots were fired at the Montage, a building in downtown Reno where SWAT teams and news vans have gathered. 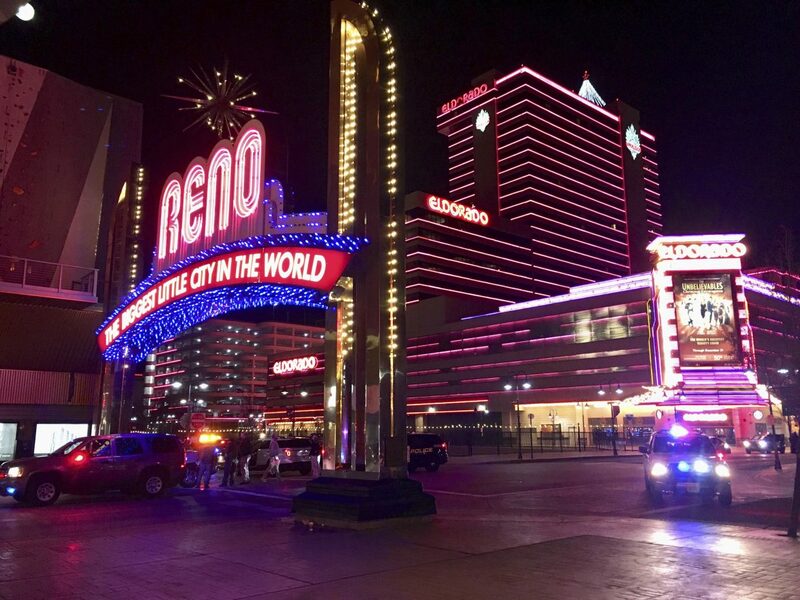 RENO, Nevada (AP) — A gunman with a hostage opened fire from the eighth floor of a luxury high-rise condominium in Nevada onto the streets below, authorities said. No injuries were reported. The man died Tuesday after a SWAT team descended on him while he was barricaded at the Montage, Reno police Deputy Chief Tom Robinson told reporters. It wasn’t immediately clear whether he was killed by police gunfire or his own. No one else, including the hostage, was hurt. Sixty-four-year-old Paddock modified an AR-15 to loose a stream of constant bullets like an automatic weapon in the attack at Las Vegas, which is 450 miles (724 kilometers) south.